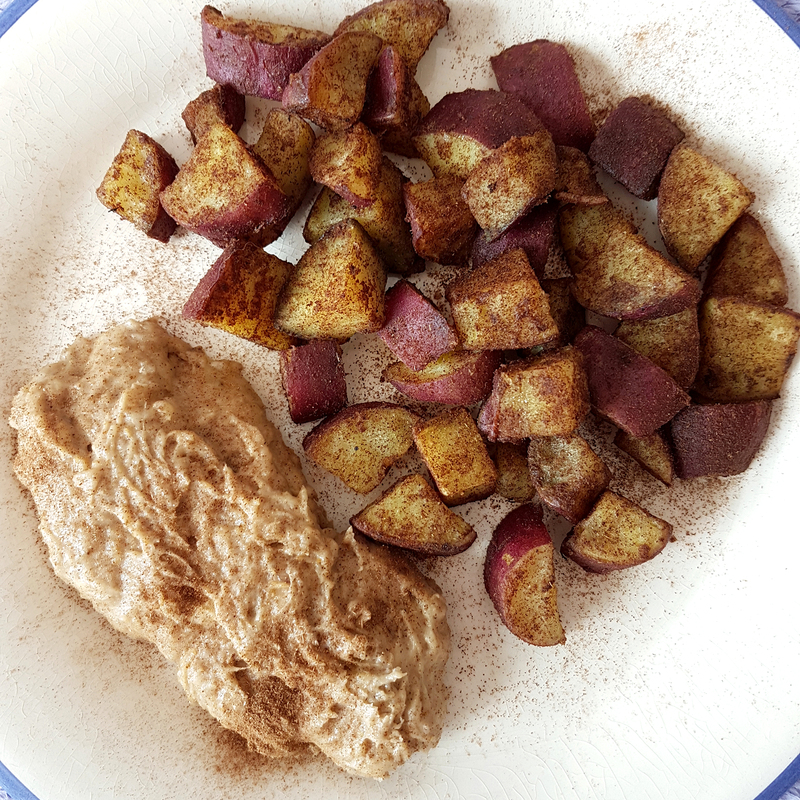 Here’s my new breakfast obsession: white sweet potatoes roasted in cinnamon and coconut oil, served with a banana and cashew butter cream. I see you looking at me funny. Sweet potatoes? For breakfast? Well, not usually. But I recently learned that sweet potato is a great food to have before training and seeing as I train around midday on weekends, I decided to move sweet potatoes to the breakfast menu. Now it’s no secret that I have a sweet tooth and savoury breakfast just won’t do for me, so I had to find a way to sweeten up those sweetie spuds. Coconut oil and cinnamon seemed like a good place to start. I’ve found white potatoes work best because they have a lighter flavour – kind of fruity – and they go so well with cinnamon. And of course I’m having them with cashew butter because I have everything with cashew butter. And because I can’t eat unlimited cashew butter (no matter how much I’d like to!) I also figured out that if you mix around 20g (a generous teaspoon) of it with a mashed banana, you not only get a super delicious, creamy dip, but it the resulting dip also goes a lot further. For example for dipping a load of roasted sweet potatoes! 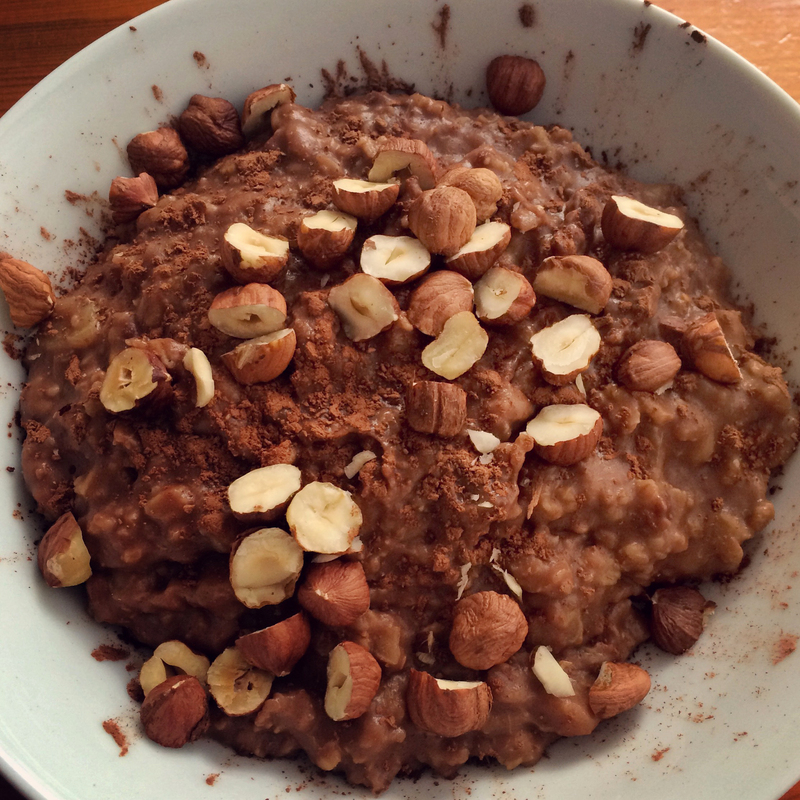 The recipe below is based on my pre-training macros but obviously adjust as needed! I have them with a vegan protein shake to cover my protein needs. Ideally parboil and chill the sweet potatoes the night before, as they will also crisp up more when you chuck them cold into the hot coconut oil. Cut the sweet potatoes into 1cm slices, then halve or quarter the slices to make bite sized chunks. Parboil in boiling water for ca 8 minutes or until they are soft when prodded with a fork. Put the coconut oil into a small roasting tray (I use a brownie tin) and heat up in the oven for a few minutes. Put in the parboiled and chilled sweet potato chunks and mix well so they are coated with oil evenly. Sprinkle over a light dusting of cinnamon and mix again. Place in the oven and roast for ca 15 minutes, or until the potatoes start to crisp up around the edges. It helps if you turn them a couple of times. In the meantime mash the banana with a fork and mix in the cashew butter until you have a smooth cream. When the sweet potatoes are crispy, serve with the banana cashew cream on the side. Sprinkle over more cinnamon to taste. Enjoy, then GO SLAY YOUR WORKOUT. I love banana bread. I could eat it for three meals a day – but that doesn’t exactly fit with my healthy lifestyle. 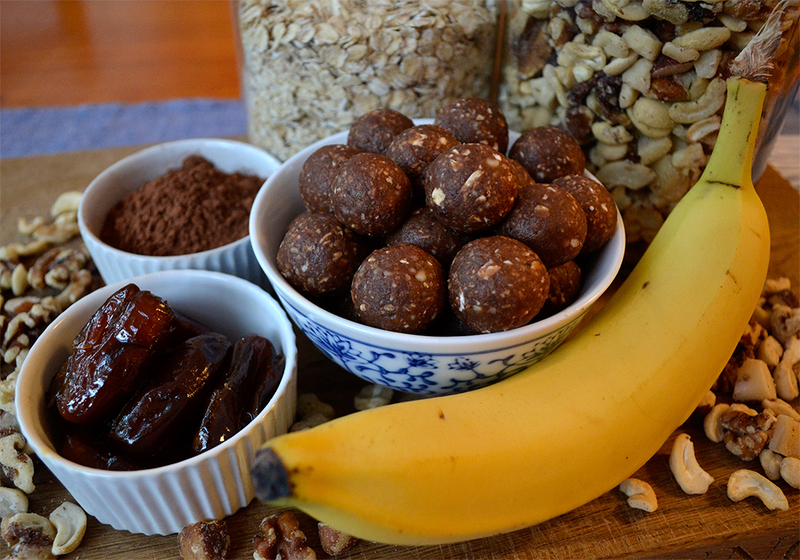 So I’ve tweaked my recipe for nut energy balls – which have pretty much become my daily go-to snack for sweet cravings and pre-workout energy boosts – to add the flavour and goodness of banana and cacao to this clean and healthy treat. Throw everything into a food processor or Thermomix and blitz until it forms a sticky dough. 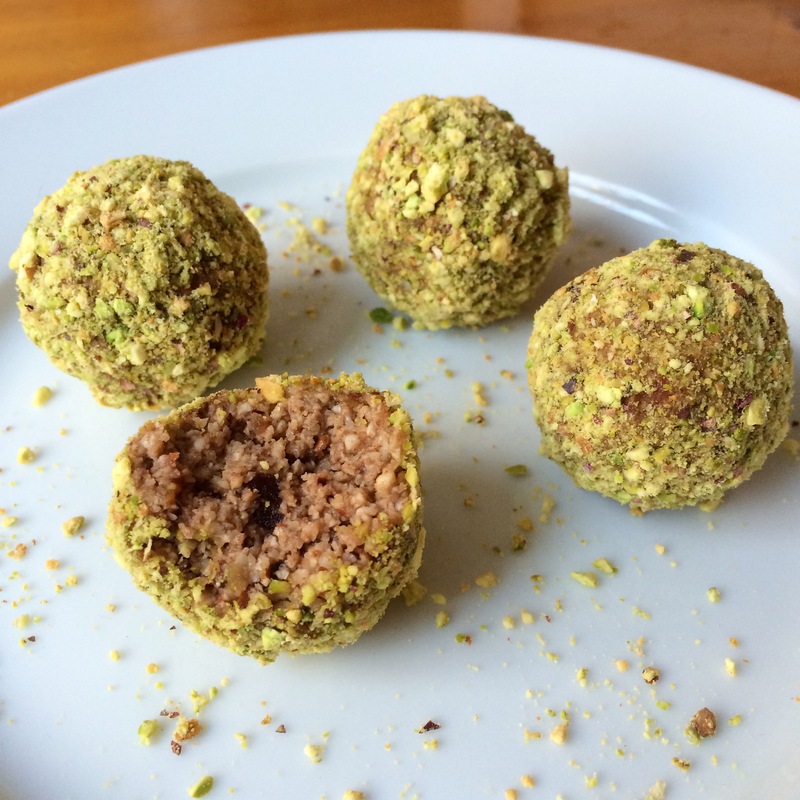 Roll into bite sized balls and store in an airtight container. They keep for up to a week in the fridge, but take them out of the fridge a while before you eat them as they’ll taste nicer when they’re not cold. As a frequent snacker I NEED cereal bars to get me through the day, but most of the bought ones are stuffed full of sugar and artificial flavourings and leave you hungry again after ten minutes. 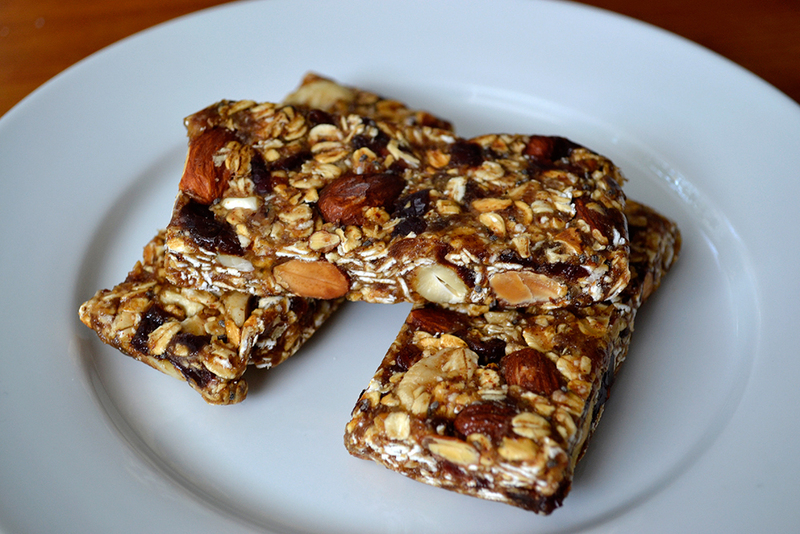 Here’s an alternative to all that: super easy, homemade cereal bars with all the goodness of nuts, fruits and natural sweeteners that actually fill you up and also satisfy all your cravings for sweetness and crunch. Totally clean and oh so good. Be warned, though: These are very addictive and it’s all too easy to munch your way through quite a lot in one go – but the ingredients pack a serious amount of energy. 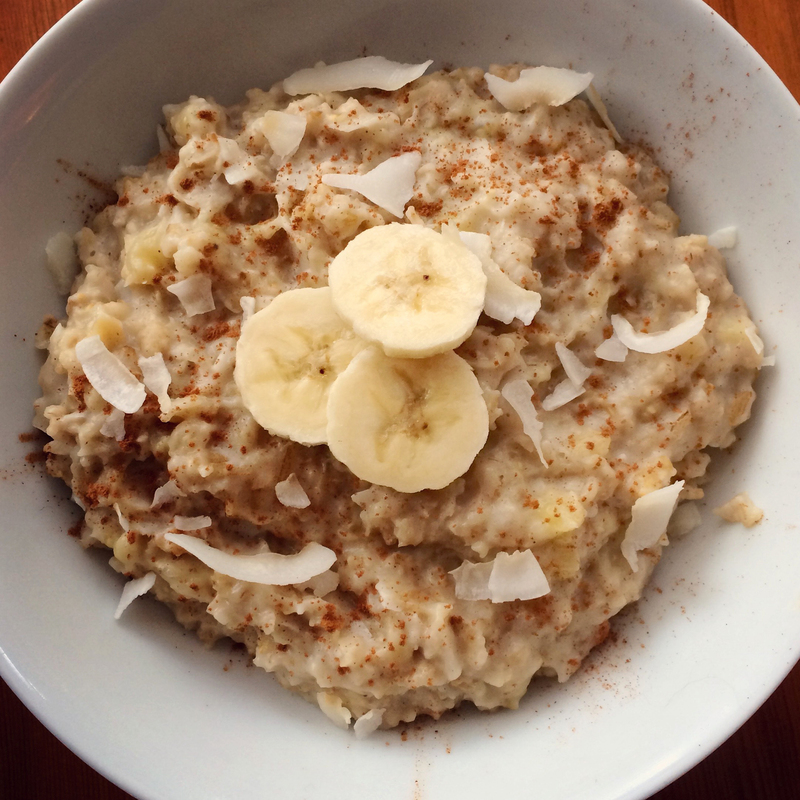 Spread the oats and almonds thinly on a baking tray and toast at 180°C for about 10 minutes. Give them a shake halfway through so they don’t burn on one side. Leave to cool. Meanwhile blitz the dates and banana in a food processor. Stir in the honey and almond butter until you have a smooth and very sticky paste. Chop the cherries and cashews roughly. Add to the toasted almonds and oats in a bowl, pour over the sweet paste and mix everything with a wooden spoon until evenly distributed. 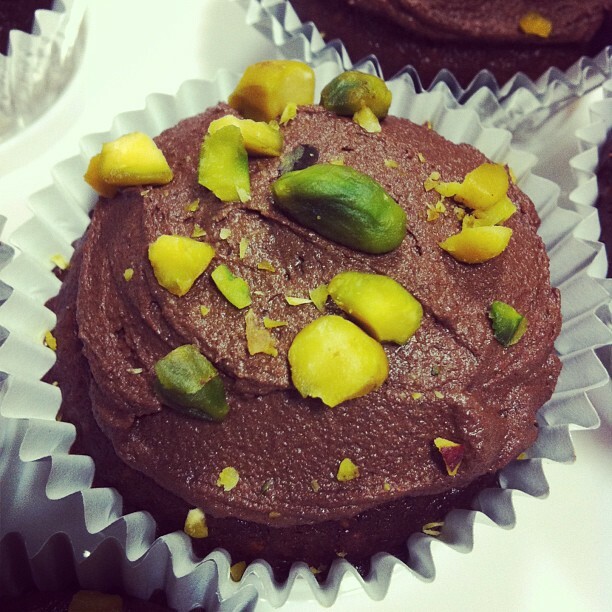 Line a brownie tin with greaseproof paper; make sure paper covers the sides as well so you can lift it out easily later. Pour the mixture into the tin and spread as evenly as you can with the wooden spoon, then press down with wet hands until the mixture is packed tightly. Leave to set in the freezer for about ten minutes. 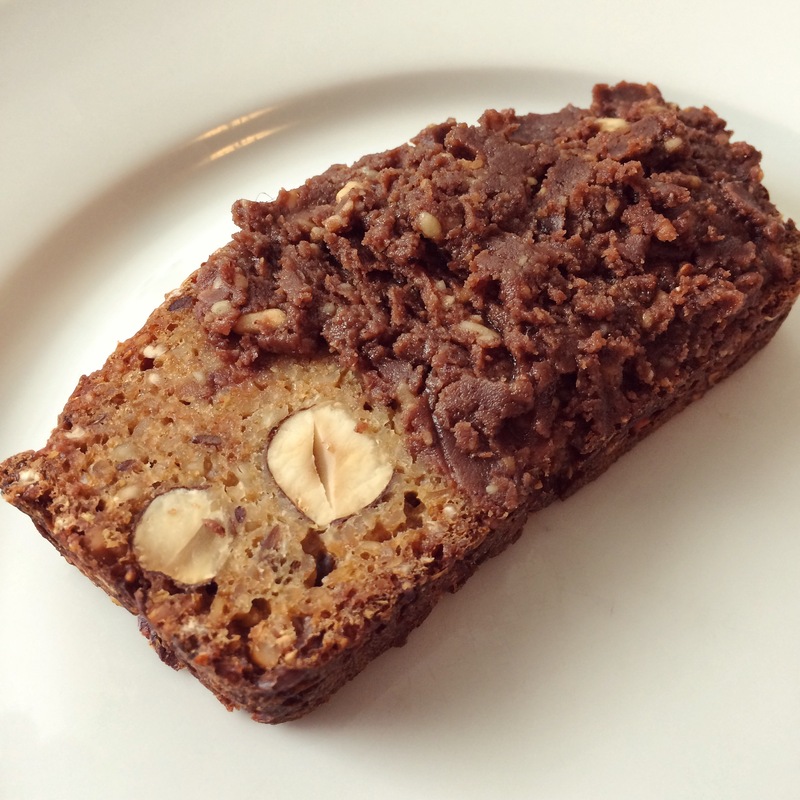 Once the mixture has set, use a sharp knife to cut into bars, squares or bites – whichever size you like. Wrap each bar in greaseproof paper and store them in an airtight container in the freezer. I’ve been blissing out on healthy / raw / vegan alternative sweet treats for the last few months and these are my absolute favourites. They taste just like cookie dough, but with all the naughty bits removed. 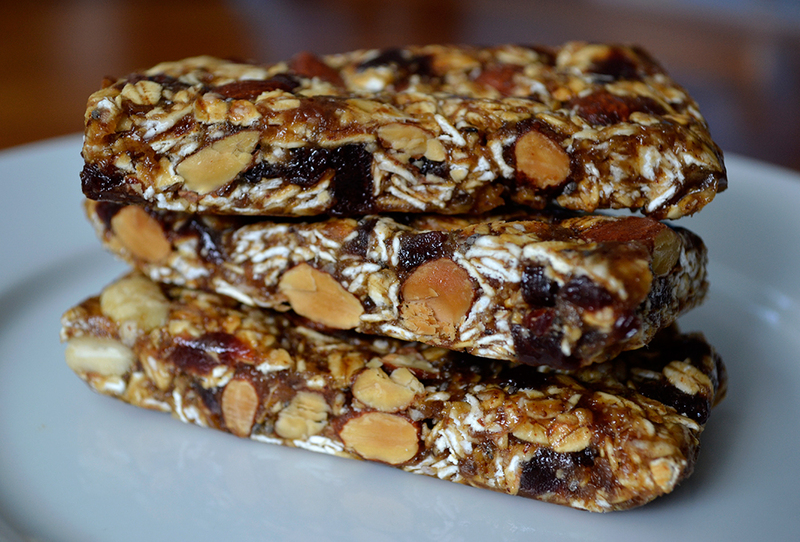 After experimenting with nuts and dates for low-guilt, high-energy treats to have as snacks before my workouts, I tried something new with these, adding rolled oats for a more dough-y texture and dried cherries because, well, mmmmh cherries! 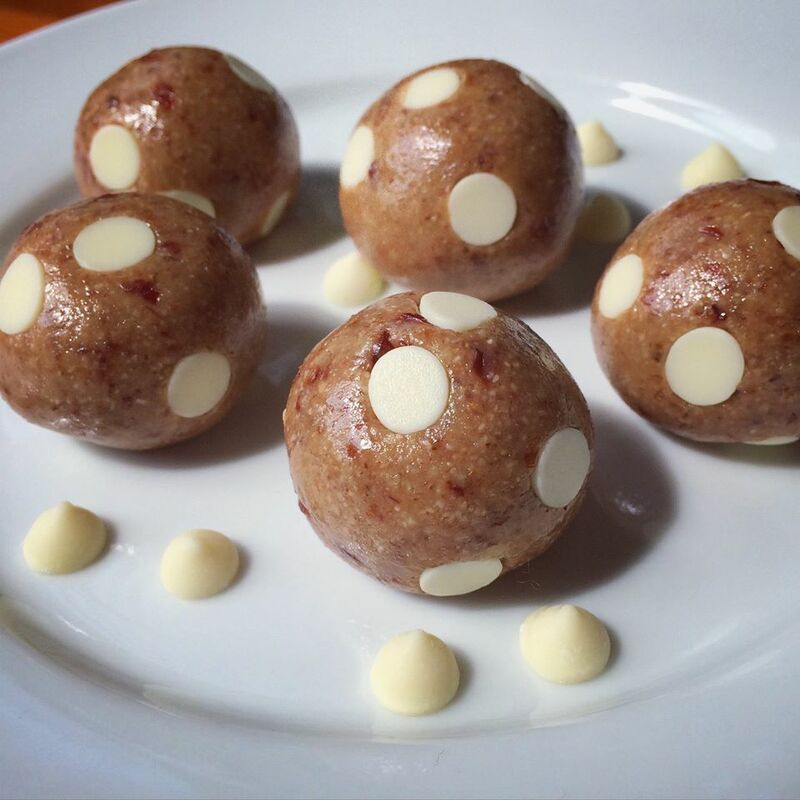 And if you don’t roll them in white choc drops they’re probably healthier, but cherry and white chocolate is too good a combination and should not be sacrificed for the sake of calorie counting. So, get ready for blissballs! Blitz the oats, almonds and cashews in a food processor until they are a fine, floury consistency. Add the cherries, salt, vanilla and sweeteners and blitz again until the mixture starts to form a dough. Form into bite-sized balls and roll in the chocolate drops. Or, for the perfectionists, if you stick the choc drops in with the point side and keep rolling gently until they’re fully submerged you get the polka dot effect. 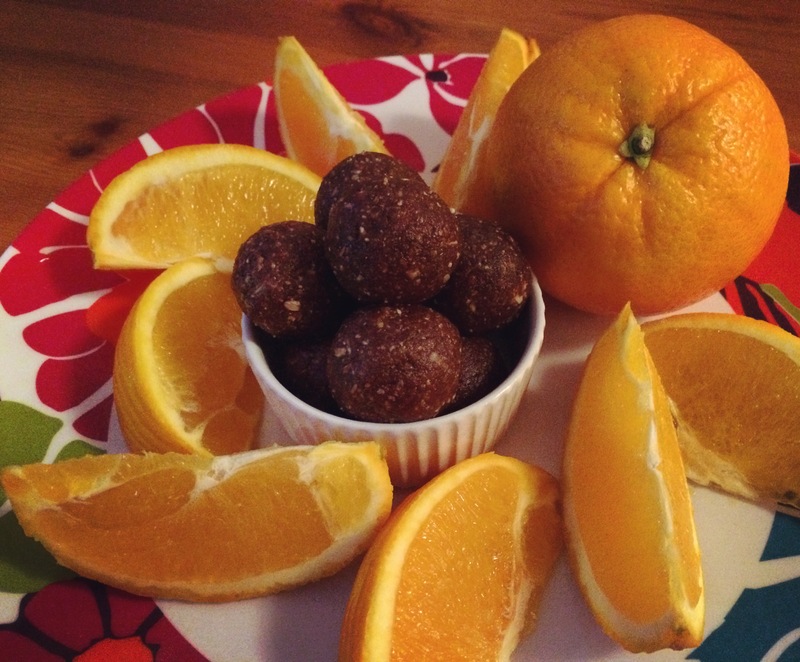 So here’s my new favourite snack format: blissballs! Refrigerate for half an hour or so; this will make the mixture easier to roll. 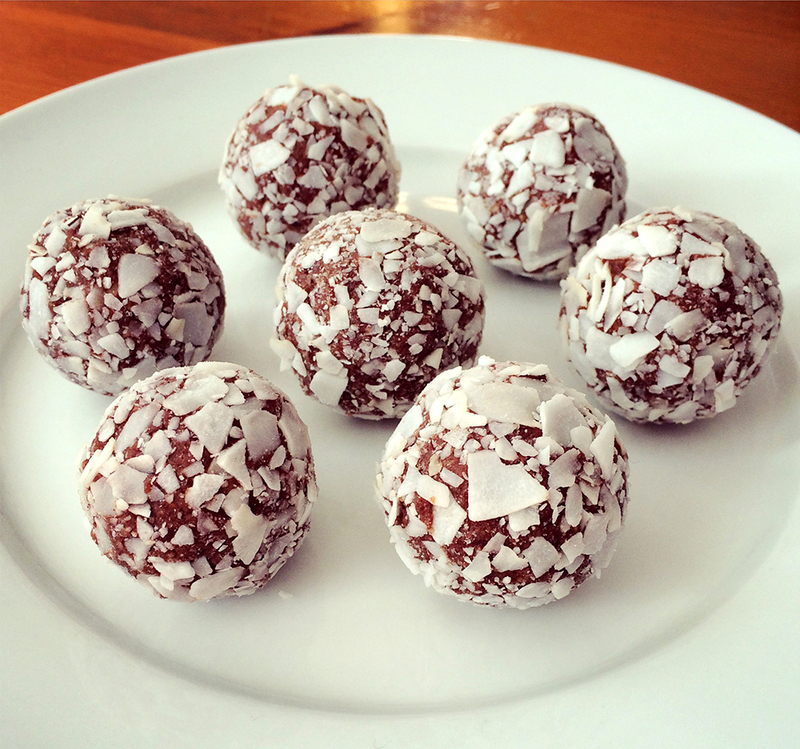 Shape into balls and roll them in coconut flakes.